The Nazi regime exploited the Jewish population economically through an increasingly systematic program of expropriation. Under pressure, Jewish owners sold their shops, factories, and land to "Aryan" businessmen at prices far below market value. After the Night of Broken Glass [Kristallnacht], the Aryanization of Jewish property entered its final phase. On November 12, 1938, Göring issued the “Decree on the Exclusion of Jews from German Economic Life," according to which Jews were forbidden to own retail stores and workshops and to sell merchandise and services. Jewish businesses were confiscated by the state, closed, or transferred to "non-Jewish" ownership. This photograph shows one such “Aryanized” business, a rubber goods store in Frankfurt am Main. 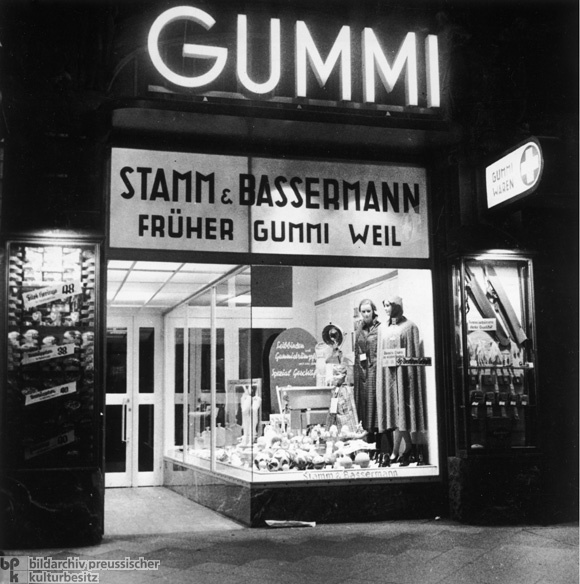 As the sign indicates, the store was formerly called “Gummi Weil” (or “Weil Rubber Goods”), but now went by Stamm & Bassermann, presumably the names of its new “Aryan” owners.